First-generation EGFR tyrosine kinase inhibitors provide a significant clinical benefit for patients with advanced EGFR-mutant NSCLC. However, most patients ultimately develop disease progression, driven by the acquisition of a second T790M EGFR TKI resistance mutation. Osimertinib (AZD9291) is an irreversible third-generation tyrosine kinase inhibitor of both EGFRm-sensitizing and T790M resistance mutants. Bevacizumab is a humanized antibody targeting the vascular endothelial growth factor VEGF, which plays an important role in tumour angiogenesis. A combination treatment that target both tumour cells and tumour microenvironment (such as angiogenesis) may be a promising strategy for further improving efficacy outcomes in patients with EGFRm (exon 19 deletion or exon 21 L858R) NSCLC following progression on EGFR TKI therapy and other lines of therapy. 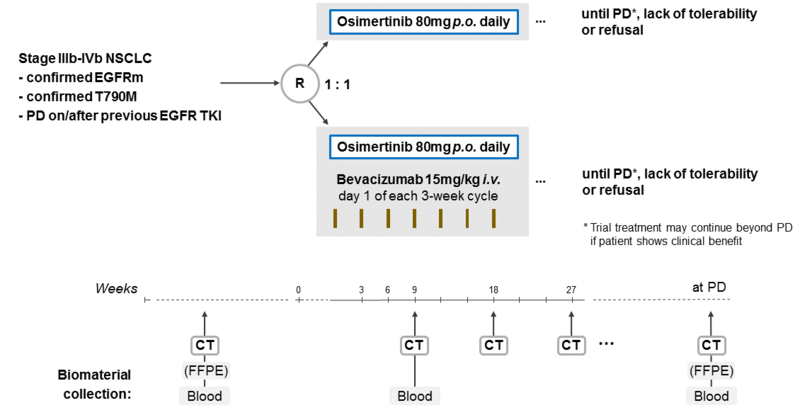 The aim of the BOOSTER trial is to assess the efficacy of osimertinib plus bevacizumab versus osimertinib alone for patients with locally advanced or metastatic (stage IIIb-IVb) EGFRm NSCLC with a T790M resistance mutation at progression on prior EGFR TKI therapy.